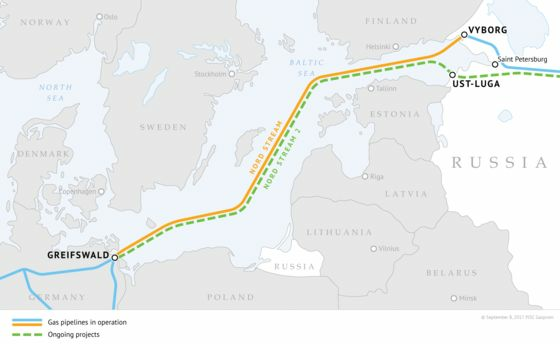 (Bloomberg) -- A controversial natural gas pipeline from Russia to Germany may be delayed after Denmark asked the company behind the link to investigate an alternative route. Denmark’s Energy Agency, which is carrying out an assessment on how the new gas link would affect the environment in its exclusive economic zone of the Baltic Sea, asked the pipeline’s promoters to study a different route. It has not rejected either of the two pending permit applications, Nord Stream 2 said on Wednesday. The move extends uncertainty about what European Union authorities might do to block the pipeline, which Nord Stream 2 says is on track to start working at the end of this year. The link has divided EU governments, with nations led by Poland concerned about the bloc’s increasing dependence on Russian gas and President Vladimir Putin’s meddling in Ukraine. The new link would allow gas to bypass Ukraine in flowing to Europe. Trump has criticized the link and called on Europe to buy alternatives to Russian gas, especially liquefied natural gas from the U.S.
Nord Stream 2 argues a new pipeline is needed to guarantee supplies will continue to flow in the coming decades as EU import needs rise. Opponents of the project say it hurts the bloc’s cohesion and weakens the bloc’s Energy Union strategy aimed at integrating the region’s gas and power markets, diversifying energy supplies and improving security. Uniper SE, Engie SA, Royal Dutch Shell Plc, OMV AG and BASF SE’s Wintershall are European partners of Russian gas export monopoly Gazprom PJSC in financing the project to expand Nord Stream by 55 billion cubic meters a year. Russia supplies a third of Europe’s gas and has no plans to give up its share to the expanding list of competitors from Norway to the U.S. The U.S. threatened to sanction companies involved in the project, with President Donald Trump arguing it made Germany “captive” to Moscow. 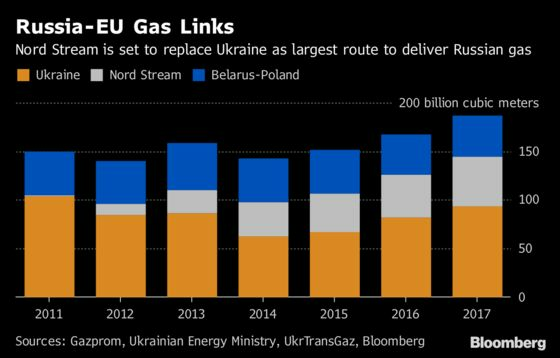 The EU earlier this year agreed to tighten rules on third-nation natural gas imports into the trade bloc that includes the requirement of separate ownership of gas and transmission lines without directly blocking Nord Stream 2. The European Parliament is set to give its final approval to the updated rules next week.